The translation below is only some parts of the radio. I only translated important parts. Minegishi: This radio program I think. Takahashi: What a beautiful answer! M: I felt it when I came again today. I asked my manager to check my speech for General Elections if it was good or not. But as for you, you’re speaking all by yourself here. You even promoted my photobook slowly and introduced a song gently before it played. Seeing Takamina like that looks so fresh to me and I want this program to continue for a long time. So that, when I have something to advertise, I can advertise them here. I feel relieved for that. Minegishi, the last 1st generation. M: I have something like a new worry now. As Haruna announced her graduation, the only first generation will be only me. T: You’re right. When I was still in the group, me, Kojima Haruna and Minegishi Minami were the last three members of first generation that time. M: Usually three of us were having problems and worried together. But when I knew it I became alone. I think that the crossroad is here now and it’s already time for me to also choose. I keep thinking of what I should do now. T: We won’t know if we don’t try to choose about when to choose and if the choice we chose is right. M: So? Was your choice the right one? M: It’s half a year already, right? T: It’s not that long! I graduated in April this year. It’s about 3 months. M: Yet you are having fun now, right? Damn, you. M: It’s going on in substantiality, right? T: But, still. Even so, I have troubles and worries. There surely are many unseen things if we don’t try to make progress of our choices. M: Name one thing you’ve seen then. T: Let’s see… I once again realized that there are people who support me. M: Yeah, you’ll think of that once you graduated. T: When I’ve became alone, I could see people whom I’ve always been questioning myself if there was one who concerned about me. You’ll think that you want to reward people who are engaging with you now once you become alone. Those people who are concerned about you, giving you works…you’ll know they’re important in your life. M: You could say that because it’s a result when you were still in the group, so many people were concerned and being kind to you, right? That’s why I’m afraid I won’t make it until my graduation… Oh, no! T: Nah! *laughs* Minegishi Minami is a kind of awkward and shy person but you’re not giving in regarding jobs. You’re a type of someone who will answer people’s requests. Miichan’s from now on is something that I’m looking forward to. Everyone should buy a photo-essay ‘Watashi wa Watashi’ which will be on store tomorrow so that they will enjoy one side of unseen Minegishi Minami in it. M: Acchan’s birthday was close, right? M: Takamina had been very busy that you couldn’t come. M: And, Acchan’s first words regarding that was like, “Takamina rejected me.” She said that in a furious tension that time. T: That, is… You know, let me get this right. Maeda-san told me on around July 8th or 9th, “Countdown and 10th are must to come. It’s an absolute obligation for Takamina!” But I have a work for House of Councillors election that day and it was also a good chance for me to study. I said properly that I can’t come. M: “Seriously, what’s with her?” or so like that she said. Everyone ate delish dishes and when it became 12pm, we shouted “Yaaaay!” and took some videos. That time, Acchan’s phone kept ringing and when she looked at her LINE, “Oh, Takamina greets me first. …I forgave her a bit with this.” She was very cute saying that. I came here to tell this to Takamina. M: She forgave you, you know? M: She was. It was surprisingly overly serious angry tone. I already knew that Takamina had a job that day, but Acchan was seriously shocked with that. M: She was seriously angry but you greeted first via her LINE and she forgave you in the end. I’m glad that you paid for your nonparticipation by greeting her. T: Of course I would greet her properly. I really wanted to come after all. M: Let’s celebrate her birthday again next time. T: By all means. 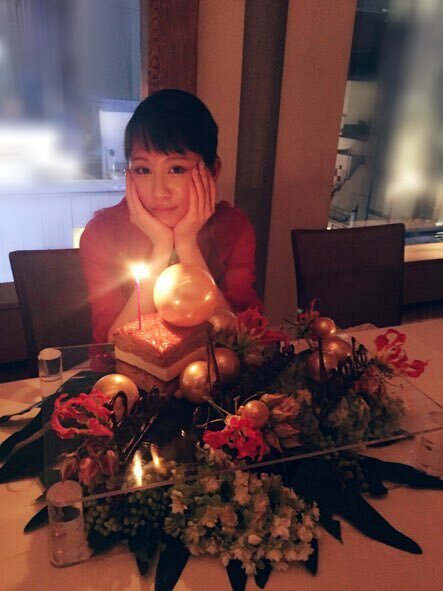 Let’s celebrate Maeda-san’s birthday again. M: Agree. Don’t forget Tomochin’s. Tomochin is also a sensitive type that might get angry. T: You’re right. Too many birthdays on July. It makes me stumped! Let’s celebrate anyway. M: Make sure you’ll really come. It’s hard to get in touch with you nowadays. I couldn’t stop grinning when I was listening to Miichan’s story about Acchan’s birthday =)) I was worried because Takamina didn’t say a thing about Acchan’s birthday in her every SNS accounts. I thought Takamina didn’t do anything to Acchan. But I believe that Takamina will never forget about Acchan’s birthday.